November 26th will see Hollywood come to Arklow. 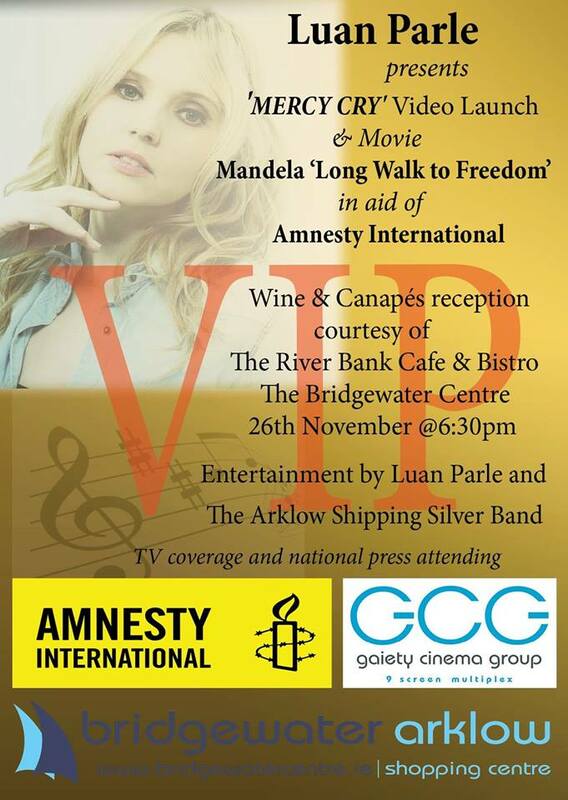 Luan Parle will host a red carpet V.I.P film night in aid of Amnesty International at GCG Cinema, Bridgewater shopping Centre. It will be a night of glitz and glamour with well known T.V and sports personalities. This one night only event will see all the proceeds going to Amnesty International. Amnesty Director Colm O’Gorman will officially launch the night and Luan will play a couple of her hits including the new no1 “Day is done”. Luan linked up with Annesty International Ireland to release the video “Mercy Cry” in a bid to raise much needed funds for the repair of Gaza. The video will be shown on the night followed by a screening of the Oscar nominated movie “Nelson Mandela’s, Long walk to freedom. Tickets are now available from McMullen’s boutique, Main Street, Arklow and Halpin’s Bridge Cafe in Wicklow town for € 20.